This overlay offers a compact and somewhat configurable view of the raid bosses status for your account(s). 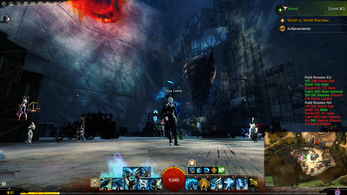 This overlay does not interact with Guild Wars 2 program in any way as it is only shown as a separate program on top of the game window and it should be ToS compliant. The boss data is pulled from GW2 official API. Grey/full colour boss icon tables (4x4) instead of text. Might look better. Maybe a toggle for that if the icons aren't noticeably better. Support for up to 6 accounts. Bugfix for resetting unused account boss tables after weekly raid reset. More graphical user interface? Messing around with text files isn't optimal. More feedback: when saving position, icon when hidden on top right corner. Fix bugs with multi-screen setups? Extract files and open Raid Status Overlay.exe. Settings folder will open with a settings text file you can set up with your api keys and information file you can read stuff from (inc. keybinds).